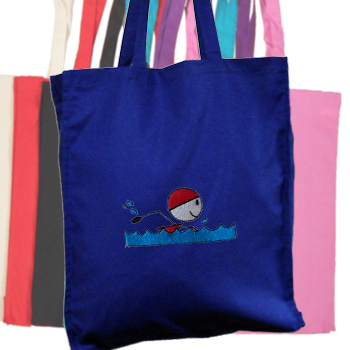 Cotton tote bag with swim motif and optional personalised name or initials perfect for the pool, beach, sports or hobbies. Select the colour tote bag you want. This all cotton tote bag is 30x40cm with a 9cm gusset so it holds plenty of goods. This all cotton tote bag is 30x40cm with a 9cm gusset so it holds plenty of goods. Features long handles so it can be hung over the shoulder. Machine washable.